Explore, Learn, Have Fun! : Cinnamon Roll Waffles ~ Super-Easy, Delicious Breakfast! Cinnamon Roll Waffles ~ Super-Easy, Delicious Breakfast! Every Wednesday I ask my FB friends "What's for Dinner?" I've been doing that for over a year, and I love getting inspired by their creative dinners each week! A few weeks ago, a FB friend from high school (Stephanie) posted that she was making breakfast for dinner and having Cinnamon Roll Waffles. One of my friends asked her for the recipe, and Stephanie said she found it on Pinterest and it was so easy! 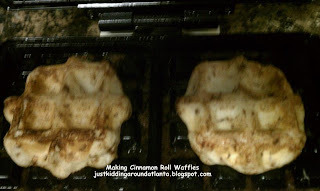 I had to try these for myself ~ and my kids LOVED them! It couldn't be any simpler: get a can (or two, or three, lol) of Pillsbury Cinnamon Rolls. 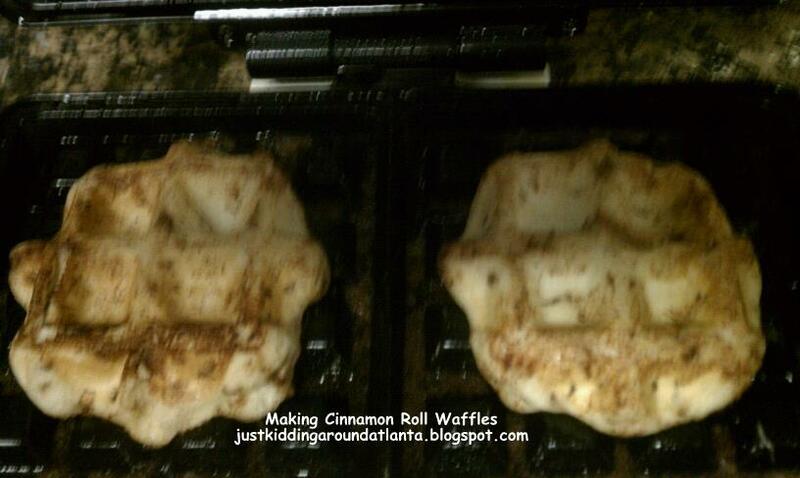 Spray your waffle iron heavily with Pam, then plop a cinnamon roll into each section. Set the icing container aside for now. We have a small, two section iron, so I made two "waffles" at a time. Close iron, cook til done. I sprayed the iron very heavily with Pam in between each batch of rolls, but it still made a mess! 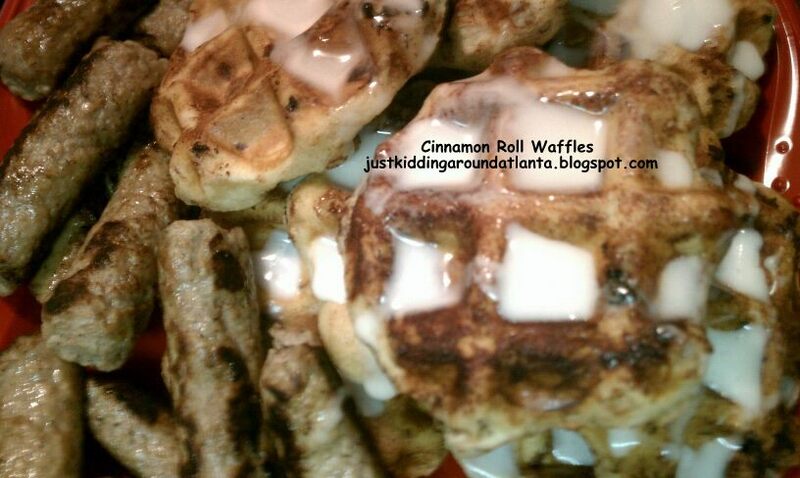 Drizzle the waffles with the cinnamon roll icing (heat it for a few seconds in the microwave first!) and serve it to your family - they will ooh, ahh, and ask for seconds! I served ours with turkey sausage links - yum! Keep an eye out for coupons for the cinnamon rolls - they are in the paper all the time, and you can often find them on coupons.com (there's even a link below in my right sidebar!) If your store doubles coupons, you'll get these for a steal! The only bad thing about these waffles is that they will make your iron a hot, sticky mess. But I think it was worth the messiness! Have you (or a friend) found a terrific recipe on Pinterest? I'd love to hear about it so I can pin it too! : ) Just leave a comment below!